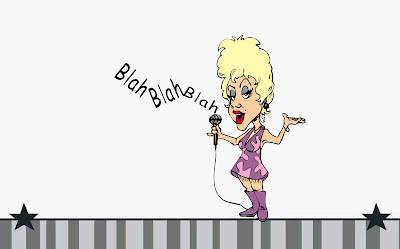 Judy Rodman - All Things Vocal Blog: Singers on Stage: Don't Talk Til You Earn The Right! 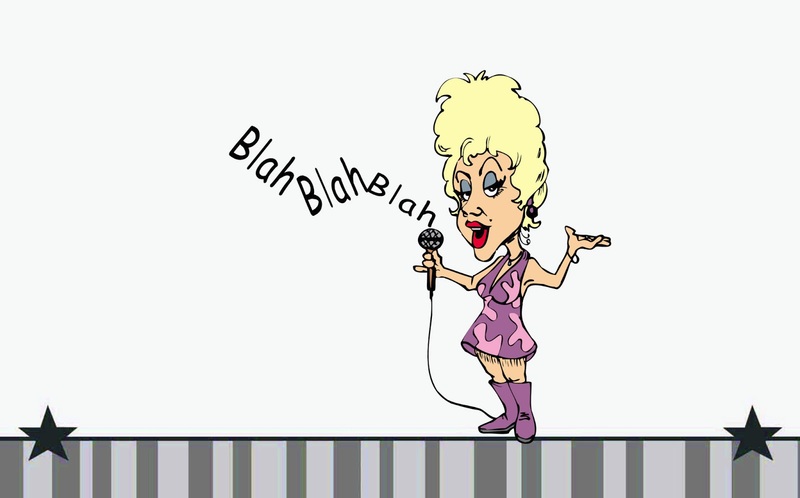 Singers on Stage: Don't Talk Til You Earn The Right! Pick your spots so words don't turn into blahs! Why say anything during a singing performance? It should be a strategy to endear and connect an artist to the audience. Yet one of the biggest turn-offs I see in amateur performers is when they do a long spoken introduction to the first song of their set! The crowd may politely listen, but trust me, you've shot yourself in the foot before you've sung your first word. Great performers and major artists tend to start a show by plunging right into a riveting opening song. They may say hello and wave or something over the musical intro, but they make sure to earn the interest of the audience before they do any lengthy stage talking. As with most of life, it's best to give before you expect to get. Give your music, get their attention, then offer a story about a song when it would add something to the show... but only when you can feel the audience in the palm of your hand. And... don't mess up a good thing by talking too long even then. Learn to read the crowd. Are they starting to drift? Do you need to go straight into another song or do you need to break things up with some storytelling about how the next song came to be or why you chose it? Are you part of a multi-artist event where the last thing everyone wants to hear is a long talking spiel about... anything!? Or do you really need to allow the audience a more intimate connection with you in a short, authentic, in-the-moment chat? Don't get me wrong... stage talk well done can connect you with an audience at a deeper level. But leave them wanting more... for goodness sake don't leaven them wanting less! I'd love to hear from you... do you have a positive or negative experience with stage talk as either performer or audience member? i agree, i talk very little on stage. mostly towards the end, and only if i'm making light of a mistake or something unusual or amusing thats going on in the venue. people like a quick joke, a giggle, some 'human -ness' (can't think of a better word). but theres nothing worse than a rambling explanation of a song, pre song. firstly, a good song will explain itself, secondly, your building expectations where you don't need too. and its definitely right that the worst place to do this is before you even start. if they want a piece of you, you will sense it, then give some chatter away. As an audience member, I like to hear the stories that some songwriters tell; yes, too long is not so good-- but if well spoken this can really add to interest and appreciation of the music. As a performer this is an area for learning, as I'm just beginning -- glad to have the tips here. Thanks much for your feedback, Diane... here's a bit of research for you that may help you decide when enough is enough: Go to a couple of different performances and focus your observation on how someone who isn't known by the audience and someone who IS known speaks to the audience. What does the performer say? What happens when the performer chooses to speak? What causes disconnect, boredom or even 'turning away/off' from those listening? What causes electricity to be felt, laughter or spell-casting silence as they get drawn in? It's an eye opener to the learning curve! When you're singing on stage, you're not only combining language and music - you've also got to deal with spatial awareness and be aware of the people around you. There's a lot going on, so watch the conductor if there is one. Enjoy the feeling of being on stage, look around you in rehearsals to get used to the size of the performance space and think how much energy you will need to fill that space. Thank you Ben, all great suggestions! Occupying the space is a very important part of 'stage presence'. My name is Amara, I am 18 years old and I'm ready to stop dreaming and actually start doing. I want to sing and begin the process of strengthening my voice. 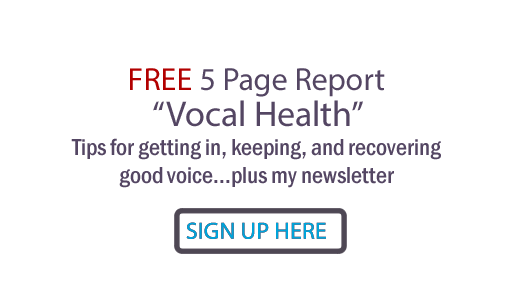 I grew up singing in the family but never had actual vocal training. My goals are to gain control and flexibility over my voice and singing boldly many ranges. Is there a way I can get in touch with you personally or in person? Hi Amara.. you can contact me through my site contact form http://judyrodman.com/contact.htm where you can leave your information and I'll call or email you back. You can book a vocal lesson with me that way, and ask any questions you have. Thanks!